Over the holidays I was fortunate to have received a copy of Antarctica by Kim Stanley Robinson (published 1998) - set in the near future and based on the author's experiences visiting the antarctic in the mid 1990s. Other than the shockingly (to me at least) high level of understanding of climate change that was known 15+ years ago, one of the most interesting elements of the book was the 8 elements of a proposed "Antarctic Protocol". These protocols, developed by the characters in the book in response to varies crises, have the goal of proposing a set of behaviors that could lead an Antarctic continent where human and other life could flourish. The first seven elements comprehensively cover the economic, social and environmental choices needed for flourishing to be a possibility. The 8th of these elements posits "What is true an Antarctica is true everywhere else (on earth)" (a compelling key hypothesis of one of the main characters). As I read them it struck me that the comprehensive nature of these proposals for the Antarctic continent were highly related, complementary and overlapping with my own proposals for design principles for flourishing organizations - introduced in this blog post "Towards Design Principles for Strongly Sustainable Organizations" (for the full text of my thinking see my thesis Chapter 4, sections 4.7.2, pp.398-403 "Towards a Theory for the Conditions Required for Strongly Sustainable Organizations" and Chapter 7, section 7.7, pp.845-856 "Proto-Strongly Sustainable Business Design Principles"). Of course both my proposals and Kim Stanley Robinson's align well with the Goals and KPIs of the Draft version of the Future Fit Business Benchmark. To allow for comparison, I reproduce below the 8 Points of Kim Stanley Robinson's Antarctic Protocols. I look forward to everyone's reactions; not least who else is doing similar thinking about the design principles for organizations who choose as a goal to create the possibility for a flourishing environment, society and economy for humans and all other life on our shared finite planet? 1. The Antarctic Treaty should be renewed as soon as possible, after whatever renegotiation is necessary to get all parties to agree to terms and sign. Some law needs to be in place. Paraphrasing the original proposal for an Antarctic Treaty, written by people in the American State Department in 1958: "It would appear desirable to reach agreement on a program to assure the continuation of fruitful scientific cooperation in that continent, preventing unnecessary and undesirable political rivalries, the uneconomic expenditure of funds to defend individual interests, and the recurrent possibility of misunderstanding. If harmonious agreement can be reached in regard to friendly cooperation in Antarctica, there would be advantages to all other countries as well." 2. In this renewed Treaty, and by a more general proclamation of the United Nations, Antarctica should be declared to be a world site of special scientific interest. Some may wish to interpret this to mean also that Antarctica is a sacred ritual space, in which human acts take on spiritual significance. 3. Oil, natural gas, methane hydrates, minerals, and fresh water all exist in Antarctica, sometimes in concentrations that make their extraction and use a technical possibility. (Oil in particular, to be specific about the most controversial resource, is located in no supergiant fields but in three or four giant fields and many smaller ones, totalling approximately fifty billion barrels). Given that this is so, and that world supplies of some of these non-renewable resources are being consumed at a rapid rate, the possibility of extraction needs to be explicitly considered by not only the Antarctic Treaty nations, but the United Nations as well. Non-Treaty nations, in the Southern Hemisphere in particular, think of the possibility of oil extraction from Antarctica as one way of solving energy needs and dealing with ongoing debt crises. At the same time current oil extraction technology presents a small but not negligible risk of environmental contamination as the result of an accident. Technologies are likely to become safer in the future, and world oil supplies are decreasing so sharply that any remaining untapped supplies, left in reserve for future generations who may need oil for purposes, other than fuel, are likely to be extremely valuable. These trends point to the idea of caching or sequestering certain oil fields for future use. Southern Hemisphere nations in need of short-term help could perhaps make arrangements modeled on the debt-fornature exchanges that have already been made; in this case, the World Bank or individual northern countries might buy future rights to Antarctic oil from southern nations, with the payments to start now, but the oil to be sequestered, with extraction to be delayed until the extraction technology's safety and the need for oil warrant it. At the same time, demonstrably safe methane-hydrate drilling could proceed, providing a less concentrated but still valuable source of fuel and income 'to the drillers, while serving also as a training ground for drilling technologies that could be considered for later use in oil extraction. 4. The Antarctic Treaty suspends all claims of sovereignty on the continent, at the same time that it specifies free access to all, and a ban on military presences for anything but unarmed logistical support. The continent is land without ownership, terra communis; it is not property but commons, in the stewardship of all humanity. It is also the largest remaining wilderness on this planet. As such it exists in an experimental legal state which cannot ban visitors. Therefore if people desire to live in Antarctica, and take that responsibility and that cost on themselves, this is their right, even if all governmental and other official organizations disapprove and withhold all support. However, because Antarctica is such a delicate environment, individuals like countries should be required to adhere to the principles of the Antarctic Treaty in its current form, and to respect the continent's status as wilderness. This adherence and respect puts severe limits on the number of indigenous animals that can be legally killed under international convention and law; thus the natural carrying capacity of the continent for human beings is very low. People interested enough in Antarctica to consider living there should keep this in mind, and a scientifically established "human carrying capacity" should be ascertained for Antarctica and for its local bioregions, and the human population of the continent and the bioregions should not exceed carrying capacity. Current preliminary calculations of the human carrying capacity of the continent suggest it is on the order of three to six thousand people, but human carrying capacity in general is a notoriously vexed topic, and estimates of capacities both local and global range over many orders of magnitude, depending on the methods used; for instance, for Antarctica figures have been cited ranging from zero to ten million. Possibly work on this issue in Antarctica could refine the concept of human carrying capacity itself. 5. If people do decide to try to become indigenous to Antarctica, special care will have to be taken to avoid polluting the environment, because the Antarctic serves as a benchmark of cleanliness for studies of the rest of the world, and in the cold arid environment many forms of pollution are very slow to break down. Some would wish to add that as sacred space, cleanliness of treatment is our obligation to this place. Again the entire continent must be considered a site of special scientific interest, in this case becoming an ongoing experiment in clean technologies and practices, including sufficiency minima, recycling, waste reduction and processing, etc. The goal should be a zero-impact lifestyle, and the reality cannot stray very far from that goal. The Treaty's ban on the importation of exotic plants, animals, and soils means that any local agriculture attempted by inhabitants will have to be conducted hydroponically or aquaculturally, in hermetically sealed greenhouses and terraria or in well-controlled aquaculture pens containing only indigenous sealife. This constraint will be one aspect of the carrying capacity calculations, and suggests also that self sufficiency for any indigenous Antarctic society or societies would be impractical and risky for the environment, and should not be considered a goal of such societies. The reliance on outside help should be acknowledged as a given. Anthropogenic reintroduction of species that used to exist in Antarctica is an issue that we leave to further discussions elsewhere. 6. The achievement of clean appropriate zero-impact lifestyles in Antarctica is not merely a matter of the technologies employed, but of the social structures which both use these technologies and call successor technologies into being, as a function of the society's desires for itself. This being the case, all inhabitants of Antarctica should abide by the various human rights documents generated by the United Nations, and special attention should be given to cooperative, non exploitative economic models, which emphasize sustainable permaculture in a healthy biophysical context, abandoning growth models and inequitable hierarchies which in Antarctica not only degrade human existence but also very quickly impact the fragile environment. 7. In such a harsh environment all attacks against person or equipment constitute a threat to life and cannot be allowed. All those interested enough in Antarctica to come here must forswear violence against humanity or its works, and interact in peaceable ways. 8. What is true in Antarctica is true everywhere else. Both impact investors and businesses seeking impact investments share a strong desire to see that businesses are tri-profitable. Tri-profitable businesses create the possibility for human and other life to flourish on this planet forever by generating as much tri-impact as possible: financial rewards, social benefits and environmental regeneration. This shared desire to maximize the tri-impact of business exists because impact investors and tri-impact entrepreneurs fundamentally share the same values and world-view about business: businesses will do best when they do good. Impact investors are incented to allocate capital (debt, equity or hybrid forms) to investments where they expect both to receive a financial return (ranging from return of principal to market-beating returns) and a defined additional social and/or environmental impact. In other words both are intending to act in alignment with their shared values. Report on whether the actions, once undertaken by the business, have produced the intended tri-impact. Impact investors can sense what risks to tri-profitability and opportunities to increase tri-impact a business has missed, and communicate this in a way an that a business can quickly improve its planned action. In summary the unresolved problem is: how can the investor and the business to quickly share the action planned by the business in a way that allows mutual understanding and learning while deepening their relationship? How can they efficiently and effectively determine if they are aligned and have a good fit for each other based on their shared values? But there is also a wider impact on society: these problems effectively limit the number of viable tri-impact business opportunities demanding investment, and the supply of impact investments seeking those opportunities. In turn, this limits the scale and speed of the impact investing market and hence the total quantity of integrated environmental, social and economic benefits being created by business to address today's most pressing challenges created by the ever growing mega-forces of change. But don't existing techniques used by profit-priortizing businesses resolve these challenges? Business Plans. First there is no agreement on what a business plan that describes a tri-profitable business looks like; every business and impact investor has their own ideas of what's required. Second, as Alex Osterwalder and Steve Blank have observed, business plans don't enable compelling story telling, they are not conducive for learning, nor are they easy for investors to assess. Reporting. First, while reporting provides some evidence of tri-impact created in the past, it doesn't give a view of the future that helps assess the quality of the planned actions to create (more) tri-impact. Second, we don't have an integrated set of reports (financial, social, environmental) that allow rating and ranking by investors. This is a large part of the challenge our colleagues in the Reporting 3.0 initiative and the Future Fit Business Benchmark project are wrestling with. As examples: The popular B Impact Assessment doesn't include the financial dimension of tri-profitability, and the Global Reporting Initiative standard doesn't allow comparison since everyone gets to choose the specifics of the metrics they report. the Future Fit Business Benchmark, a tool to communicate the quantity of tri-impact a business is currently creating in the world. Let's explore these two new tools and how the solve the problem of developing values aligned shared understanding, mutual learning and relationship building via story telling between impact investors and businesses. Business models are a language shared by investors and business to describe action a business is planning. Identifying the elements of a language and collaborative visual design tools to describe and design financially viable business models was the amazing contribution of Alex Osterwalder in his million selling book "Business Model Generation". But impact investors and tri-impact entrepreneurs need an expanded language for business modelling that includes not only the elements of financial viability, but also a full conceptualization of tri-profitability and the root enablers of the possibility for flourishing. To find these root enablers for flourishing we must look to the natural and social sciences to inform our understanding of the elements required to describe a tri-profitable business model. In our recent research we developed a solid understanding of the relevant science and used this to develop the shared language of tri-impactful business models. We then developed the Flourishing Business Canvas as a visual design tool using this language (you may have heard us talk about an earlier version that was known as the Strongly Sustainable Business Model Canvas). We're also using the same understanding of the root causes to describe "design principles" for flourishing business" which can help businesses design their business to create the most tri-impact now and in the future. But having a shared language to describe flourishing business models, the actions a business plans to take in the future to be tri-profitable, is only half the story. Once an investment has been made by an impact investor in a business, both parties are keen to know if the flourishing business model they now share an understanding of is in fact creating the tri-impact they both desire. To do this we believe the business should report its performance based on the same understanding of the root causes of tri-profitability used to describe its flourishing business model. By doing this the reporting becomes a key part of a powerful learning feedback loop for both business and impact investors. We believe this returns reporting to its role as a powerful shared learning and decision making tool - as suggested by the Total Quality Management movement (Dr. Edwards Deming) in their now famous Plan, Do, Check (report), Act continuous improvement cycle. But what business performance reporting system is based the same understanding of the root causes of tri-profitability as the Flourishing Business Canvas approach? 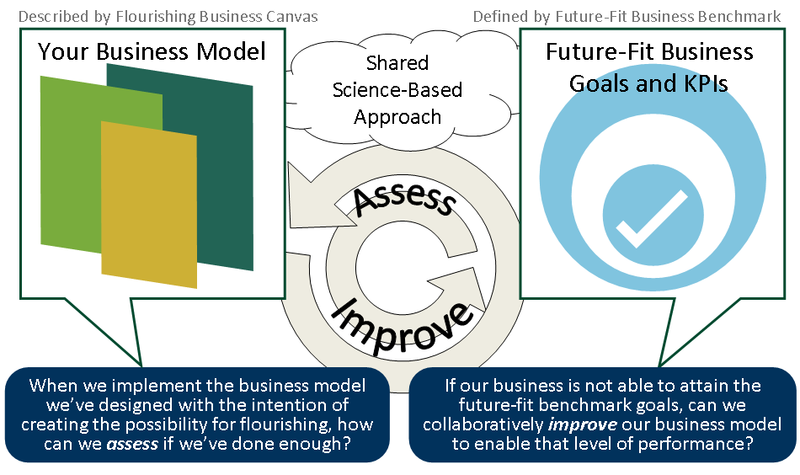 While the B Impact Assessment is well aligned with the underlying science, to our knowledge to date only second project we're involved with, the Future Fit Business Benchmark, uses this same understanding of the same science to build its KPIs and goals. The following diagram shows how together the Flourishing Business Canvas and the Future Fit Business Benchmark are symbiotic approaches to help businesses achieve tri-profitability and maximize their tri-impact. We'd like to invite you to explore how impact investors and business seeking impact investments can use this new language of tri-profitable, flourishing, business models and reporting to more efficiently and effectively achieve alignment based on their shared values. the Flourishing Business Canvas and join the 325+ practitioners and academics in the Strongly Sustainable Business Model Group, hosted by the OCAD University's Strategic Innovation Lab. Many CEOs, are struggling to connect sustainability / CSR / Green with innovation and improving profitability. This 2013 Accenture UN Global Compact survey highlights how many don't yet see how much the world has changed. CEOs increasingly know why sustainability is important, but they largely don't understand the deep connection between sustainability thinking and solving their increasingly pressing innovation and profitability problems. But we also know CEOs are only part of the innovation culture and process in any organization. For example, embedded in that culture are the "profit-first" approaches to problem solving, innovation and increasing profits taught in most business schools world-wide for the last 60 years. These approaches assume that the only sources of innovation are those that directly focus on reducing costs and increasing revenues - regardless of longer term impacts, externalities and "unintended consequences". Indeed applying these old approaches will increasingly harm business performance, unknowingly exposing business to additional risk. So what has changed? Why have the traditional approaches to innovation become "old school", unreliable and risky? What has changed is the ever growing impact on business opportunity and risk of the "global mega-forces of change". The global mega-forces of change and opportunity all come from outside this typical profit-first business sphere. Mega-forces such as climate change, energy, population, materials and water scarcity, wealth and income inequality, and food security. As a result, these global mega-forces are ignored by "old school" approaches. They are a new and largely untapped source for innovation and profitability. Start-ups, small, medium and large businesses, such as those mentioned in the reports at the end of this post, are already starting to out perform in their markets because they are now tapping into this new source of resilient profitable innovation. Further, because the "old school" profit-first approach to innovation systematically ignores (or worst denies) the mega-forces as a valid source of inspiration, the material risks created by those same mega-forces are also ignored. This means "old school" innovations have unknown levels of monetary and reputational risk for investors, shareholders, and indeed all stakeholders. Lastly, the "old school" profit-first approach to innovation means employees and other key stakeholders can't live their deepest held human values in their working lives. We are told everyday that only innovations that reduce costs or increase revenues are "good" - even when we know they will harm us, our families, communities, countries and the world - upon which we ultimately depend. This creates significant individual barriers to engaging with the "old school" approach innovation. These old approaches create pain as individuals experience the disconnect between their values and what they need to do to undertake their jobs. In turn employees dis-engage, their health is impacted, as is the companies performance, as ultimately the best employees leave (incurring disruption, re-hiring, re-training and reputational losses and costs). What is a better approach to resilient profitable innovation that manages traditional and mega-force risk and engages employees? How can a business innovate sustainably so it is resilient and always fit for the future? New innovation tools that can help integrate the innovations into new and improved business models. Resiliently profitable: They reliably provide genuine wealth to all stakeholders - including a reliable financial return to shareholders. Systematically aware of and mitigate risks from all sources: They resiliently face change from all quarters. Aligned with deep human values: They will have a mission and vision that enables them to behave authentically with all stakeholders, enabling all of them to be genuinely and sustainably innovative. As a result, such better businesses proactively contribute to a resilient sustainable environment, society and economy. They create the possibility that human and other life can flourish on this planet forever. There is increasing evidence of both the limitations of the old innovation approaches, and the benefits of the future fit alternative (see the items at the end of this post for pointers). Further, there are already 1000+ companies world-wide who are certified as using this approach to resiliently profitable innovation and tens of thousands in wider communities such as the Business Alliance for Local Living Economies. How do you begin on your journey to resilient profitable innovation? Our Strongly Sustainable Business Model Canvas is a tool that helps companies learn about the impact of the mega-forces on their current business, diagnose current innovation challenges and design new and improved business models. This tool was created to systematically enable you to see the risks and opportunities that arise from both traditional sources of innovation and the mega-forces. Using the canvas to innovate over time ensures that the connection between sustainability, innovation and stakeholders' deepest values are baked into the heart of your business. As a result your company can become authentic and resiliently profitable: able to sustainable innovation in the face of the ever increasing mega-forces. How do know if you are progressing on your journey to resilient profitable innovation? B Lab's Benefit Corporation Impact Assessment and Certification are currently the best way to quickly find out if you're doing a good job of leveraging the innovation opportunities and avoiding the increasing risks of the global mega-forces, all whilst remaining profitable. 1000+ companies world-wide have found that the impact assessment is also a tool for demonstrating your progress publicly. This, in turn, can help attract new customers, innovative financing and other innovatiave stakeholders. The PROMoting Business Excellence (PROBE) network's benchmarks for Sustainable Business and Innovation Excellence gives you a detailed comparison of best practices against current practices. To explore how you can begin this journey for your business please see BetterMy.Biz - a collaborative initiative of a number of companies, including Edward James Consulting Ltd. If you're interested in learning more about this topic please join the 250+ practitioners and academics in the Strongly Sustainable Business Model Group, hosted by the OCAD University's Strategic Innovation Lab. Expect the unexpected: Building business value in a changing world. KPMG International. The key chart from this report is Fig 49 on PDF page 133. It lists the global mega-forces of change, and the resulting risks and opportunities that are missed by the "old school" approach to innovation. Committing to sustainability with Unilever, a ~4min video recorded by McKinsey & Company with Unilever CEO Paul Polman. In this video he concisely and powerfully makes the connection between Unilever's improving profitability and the innovations inspired by sustainably thinking - including the impacts of the global change mega-forces in all tactical and strategic planning. The New Sustainability Advantage by Bob Willard. This book identifies the 7 elements of the financial business case for a Better, Future Fit, Business. Dr. Willard documents how better businesses can improve financial profits by 50% within 3-5 years while simultaneously reducing risk - and all this by only implementing existing proven practices already implemented by others. Make the Case for Business Sustainability by the Network for Business Sustainability (NBSNet) that "regardless of industry or organizational size, this site will help understand how to create value through sustainability." Sustainability Driven Innovation: Harnessing Sustainability's Ability to Spark Innovation. Deloitte. The report Intro States: Sustainability and innovation go together. Our research has shown that companies that pursue sustainability significantly increase their chances of becoming innovative leaders in the process. Breaking Through: How Corporate Social Innovation Creates Business Opportunity. KPMG Canada, Volans, and Social Innovation Generation. "Today, many business leaders realize the challenges facing our society can adversely impact business. And more broadly, businesses can make a powerful contribution"
For Companies, It's Not Easy Being Green. Booze + Allen / Strategy + Business which summarizes much of the recent academic research related to the connection between Green / CSR and Profit. "Leading companies that have implemented sustainable initiatives along their supply chains have seen a corresponding boost in their financial performance. But there's no reward for a half-hearted implementation"
Are You Ready for the Resource Revolution. McKinsey & Company. This article summarizes a book about the risks and opportunities of the materials scarcity mega-force. There is a short video of this article here. Remaking the Industrial Economy. McKinsey & Company. A report and collection of articles about a "regenerative economic model-the circular economy-is starting to help companies create more value while reducing their dependence on scarce resources." Of course all this requires a huge amount of innovation of all types! Meet the Aspirational Consumer. New research from BBMG and GlobeScan identifying a new fast growing consumer market segment "who are driving innovation, business growth and positive impact". Good introduction to this research in this recent Fast Company article 5 Secrets To Engaging Aspirational Consumers. The Impact Generation Has Arrived. New research from Deloitte "Millennial Innovation Survey" talks to the changing expectations of business that milliennials have as they become customers, employees and investors. As this Forbes article concludes "Should we not look to the power of the free market for help solving our problems like public health and climate change? Over the next decade, society will demand that the business community address, or at least respond, to these issues, and the businesses that do so will reap the greatest returns. They will do it through better customer loyalty, a higher-skilled and more motivated workforce, and a lower cost of capital. For investors, that is a winning combination that spells impact." Not Business as Usual. A feature length video featuring case studies of small and medium sized companies adopting the future fit approach to resilient profitable innovation. A wonderful new visual story from Patricia Kambitsch at PlayThink, one of the 12 members of the Core Development Team for the Strongly Sustainable Business Model Canvas, giving the background to what we're helping businesses to do... understand and adopt strongly sustainable business models. Last night I made the first public presentation of the results of my 3 year research project on Strongly Sustainable Business Models. Here's a ~3 minute audio-visual overview of the research project, the canvas and the next steps. The presentation was made to the Canadian Association of Certified Management Consultant's Energy and Climate Change Special Interest Group in Toronto (Advertising for the talk is here) . This is the presentation I made (unedited audio of the presentation and Q&A is available upon request). The presentation is available for download on Slideshare. I highly recommend you download it, view it in slideshow mode with the speakers notes; SlideShare appears to mess up some slides, and the speakers notes and animations (which aid comprehension) are not visible. The presentation was very much an experiment for me: how I told the story of my work, how I had constructed my slides, how I engaged with the audience (we had a number of exercises for the audience to try). All in all it went off pretty well, although a combination of great questions and slightly too much material got us a little off track on timing. Got some good ideas on things I don't need to talk about at such an introductory presentation: some topics can wait for a deeper dive. I also took the opportunity to conduct a small and highly unscientific survey the audience on the factors which they consider important to participating and funding a crowd-funded collaboration project - such as the one which the Strongly Sustainable Business Model Group is planning to undertake to bring the Strongly Sustainable Business Model Canvas to the world (described towards the end of the presentation - slides 40-45). People like the idea of making the book applicable to people and organizations at all stages of their sustainability journey - from just starting out to higher levels of maturity in achieving sustainable results. The majority of the possible funder / collaborator value propositions (slide 45) were considered to be required or important by this audience. 80% of the respondents would fund the project and one was interested in joining the core writing team. Wow... looks, at least in this community, like people are interested in our plans and willing to vote with their commitment and money! All in all an empowering evening... looking forward to figuring out how to boil this down to 15-20 minutes for a highly informed sustainability audience at the Open Space portion of The Natural Step Canada Accelerate conference in Guelph, Ontario, Canada June 10-11! Looking forward to seeing everyone there! The title of Nathan Shedroff's excellent 2009 book Design is the Problem: the future of design must be sustainable identifies a key challenge of our time: how can we best design so that what we create is sustainable? What are the principles for designing things, policies, business models, organizations, services processes etc. which would lead all of these to be resilient and sustainable? Shedroff provides an introduction to a very wide range of the current sustainable design approaches, tools, techniques, frameworks. However, while Shedroff's introduction is excellent, it has a key weakness: he doesn't explore in depth what sustainability might mean in general, in the context of the design process and outcomes, nor whether the material he presents is consistent with such an understanding. John Ehrenfeld, considered by some to be one of the founders of the Industrial Ecology movement, attempts exactly such a deep dive in his excellent 2008 book Sustainability by Design: a subversive strategy for transforming our consumer culture. flourish on this planet forever. The book proceeds with a deep, daring and worthy attempt at deriving design principles which, if followed, would reliably create flourishing. This is in itself a must read: Dr. Ehrenfeld explores the parameters and considerations for such design principles. He starts with a diagnostic of humanities current mode of "having" (as opposed to "being") and then builds from an exploration of fundamental human (and non-human) needs by Manfred Max-Neef. Unfortunately, by his own reckoning, he doesn't succeed at identifying sustainability design principles. This is rather frustrating, although given the complexity of the goal entirely understandable; indeed it appears that Dr. Ehrenfeld himself is disappointed. Having clearly establishing the knowledge frontier he is unable to see through the fog beyond. So where might one turn for such principles? What was the barrier that prevented Dr. Ehrenfeld from penetrating the fog of the unknown? Oddly perhaps, an idea struck me while reading the latest work by Donald A. Norman, who some consider the father of Human Interaction Design (HID, often called Human or User Interface Design). As examples: in the 1980's he helped establish the Apple Human Interface Guidelines and then in the early 1990's wrote the seminal Design/Psychology of Everyday Things (to be revised fall 2013 with new chapters on Design Thinking and Design in World of Business). What's odd? As far as I am aware, at least professionally, Dr. Norman has never expressed views or an interest in environmental, social and economic sustainability; although of course a good user interface based on empathetic understanding of the user is a (small but vital) component of enabling human flourishing. This latter idea is one Dr. Norman has consistently made. So how did the connection between HID and Sustainable Design principles arise in my mind? Let me tell you the story. In Living with Complexity Dr. Norman does two important things. Firstly presents a mea culpa of sorts from his prior works. He (finally) recognizes that simplicity should not be the goal of Human Interaction Design; rather the goal should be the presentation of the complexity necessary and inherent in all human activity in ways that facilitate learning, and efficient and effective use of a socio-technical system's functionality. It is clear that this re-framing of the problem that HID attempts to solve better aligns it with finding solutions to the problems arising from necessary complexity of the simultaneous integration of the environmental, social and economic. As Dr. Ehrenfeld points out, this integration is required for human flourishing, and of course, is generally ignored by profit first businesses (at an every increasing risk to their shareholders)! Feedback to disclose what action has just taken place. "These are fundamental principles of interaction derived from understanding the psychology of the users. As a result, these are independent of the platform and the form of interaction. Whether the interaction is controlled by buttons and levers, steering wheel and foot pedals, mouse and keyboard, gestures in the air or touchpad, these fundamental psychological principles still apply. The principles will be implemented differently for different systems of control and interaction, but they must be followed if the resulting systems are to be understandable." So this in my mind led to a question: might these principles be the basis for the sustainable design principles which Ehrenfeld failed to find? Might this profoundly empathetic approach to HID design be at the heart of the design of sustainable and resilient things, policies, business models, organizations, services processes? So returning to the title of this post... perhaps Shedroff is only partially correct in his assertion that "design is the problem" and that "the future of design must be sustainable". I wonder if a collaboration of designers, and a synthesis from their respective works, for example Ehrenfeld and Norman might not also be required. Imagine if Norman's socio-technical HID principles could be applied to the deep systems oriented understanding of the sustainability and resilience problem space which Ehrenfeld has developed? How cool could that be? I will be attempting to get Ehrenfeld and Norman to comment on this idea... if you know either of them, and think this idea has merit, please bring this post to their attention! Ehrenfeld, J. (2008). Sustainability by design: a subversive strategy for transforming our consumer culture. New Haven, Connecticut, U.S.A.: Yale University Press. Norman, D. A. (2011). Living with complexity. Cambridge, Massachusetts, U.S.A: MIT Press. Shedroff, N., & Lovins, H. L. (2009). Design is the problem: the future of design must be sustainable. Brooklyn, New York, U.S.A.: Rosenfeld Media.